Circa 1900 - Before WWI this town was Belz, District Sokal, Province Galicia, Country Austrian Empire. Circa 1930 -Between the wars this town was Belz, District Sokal, Province Lwow, Country Poland. 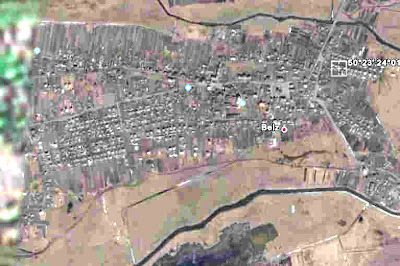 Circa 1950 - After WWII this town was Belz, Country Soviet Union. 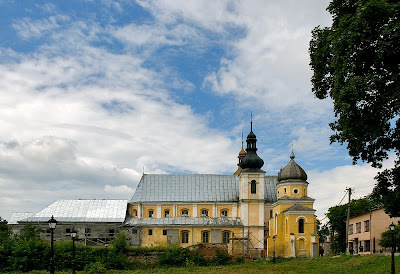 Today (circa 2008) this town is Belz, Lviv Oblast, Country Ukraine. If you have any additional information, or if you want to make a correction to some of the posted information, post a comment here or send me an e-mail message at binenbaum@earthlink.net (to post a comment go to the bottom of this posting and click on the red word "comments"). 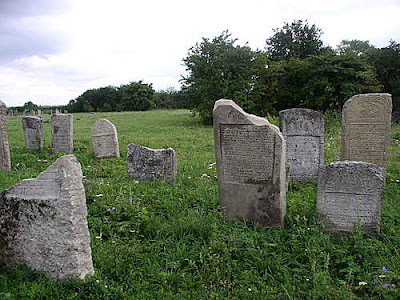 I have been told that whatever might be available of the birth, death and marriage vital records of Belz Jewish families might be located at the The Central State Historical Archive in L’viv. The vital records of the Roman Catholic Archdiocese are found in Fond 681, together with all documents pertaining to the Roman Catholic church. Opys 2 is the specific grouping of all vital records—the birth, marriage, and death record books kept by the church. Each bound book of records (called a metrical book, in Ukrainian метрична книга, metrychna knyha, in Polish etryczna książka) is a separate sprava and there are over 2,600 spravy. Some of these spravy contain over 200 arkushy or pages. Vital records of the Greek Catholic Church are kept in Fond 201, Opys 4a. There are also well over 7,000 spravy or parish books in this collection. In 2001, the Family History Library has already microfilmed 35% of the Greek Catholic parish registers. (The most recent information on this collection of microfilms can be found in the East European Genealogical Society’s publication, East European Genealogist, Volume 9, Number 3). As of this date, there are 72 people who are searching for 125 ancesors who at one time might have been born, died, married or lived in Belz. The archival system of Ukraine employs more than 3,000 archivists and other staff members. Archival institutions under the State Committee on Archives of Ukraine; preserve more than 55 million files (units, or sprav), 74,000 video documents, more than 1 million photo documents, 30,000 audio documents and 613,000 items of scientific and technical documentation, all included in the National Archival Fond. 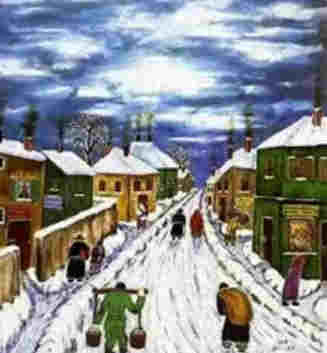 There is a very good recording of the Yiddish song "Beltz, Mayn Shtetele" (My Little Town Belz) on YouTube. This is a moving evocation of a happy childhood spent in a Shtetl. Although this song pertains to Belz, the Moldavian town in Bessarabia now called Beltsi it is still very nice. Alexander Olshanetsky (1892 – 1946) was born in either Belz or Odessa. He had a traditional Jewish and a modern Western oriented Gymnasium education. As a boy, he sang in synagogue choirs and began violin studies at the age of six—learning several other instruments as well. In 1911, at the age of 19, he left home against his parents’ wishes to join the Odessa Opera and Orchestra. He was drafted into the czarist army with the outbreak of World War I. While in the Russian army as a regimental bandmaster, he traveled to Kharbin, Manchuria, in northeast China, where he encountered a Yiddish theater group and started writing Yiddish songs. He came to American in 1922. He expressed his longing for his old hometown Belz, the Moldavian town in Bessarabia now called Beltsi, 60 km north of the Rumanian city of Yaas (now called Iasi) by writing the Yiddish theater song Mayn shtetele belz. He was one of the most prominent composers and conductors associated with the American Yiddish Theater. Tell me old man; tell me quickly because I want to know everything now! How does the little house look, which used to sparkle with lights? Does the little tree grow which I planted long ago? Belz, my little town! The little house where I spent my childhood! The poor little room where I used to laugh with other children! Every Shabbos I would run to the riverbank to play with other children under a little green tree. `To read by the river' must be the tributary of the Dnestr-river, who rises in Carpathians and flows 1400 km later into the Black Sea. Ukraine contains the third-largest Jewish community in Europe and the fifth-largest Jewish community in the world. The majority of Ukrainian Jews live in four large cities: Kyiv, Dnipropetrovsk, Kharkiv, and Odesa. Despite the limitations imposed on them by various governments and regimes throughout modern history, Jews played a major role in developing Ukraine's commerce and industry as well as the major urban environments of Ukraine. 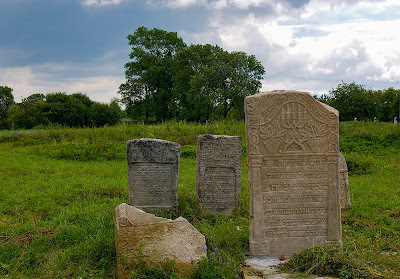 The Jews within the boundaries of present-day Ukraine share their heritage with all of East European Jewry, especially those Jews of Russia, Belarus, Poland, and Romania. Jews in these lands in the nineteenth and early twentieth centuries developed various forms of religious and national identities that allowed the Jewish community to adapt to the changing social and political environment in the area before 1939. While many Jews in the area were adherents of Hasidism, an eighteenth century pietist religious movement, others were attracted to the ideals of the Jewish enlightenment, or Haskalah, that allowed for entrance into modern, non-Jewish society and the continuation of an identification with the Jewish community. At the end of the nineteenth century and beginning of the twentieth, the Jews of Eastern Europe participated increasingly in modern political parties, both Zionist and socialist. Zionists worked toward the development of a Jewish state in Palestine and toward the development of Hebrew culture in Eastern Europe. The Bund, a party of Jewish workers, was a unique attempt to combine the ideals of socialism with Jewish nationalism. While the most radical Jewish political leaders rejected traditional Jewish religious practice, Jewish religious ideals were an essential part of these movements for many leaders and participants. Yiddish was the language spoken by the overwhelming majority of East European Jews. Many of the most important writers of modern Yiddish literature lived and worked in the lands of present-day Ukraine, especially in the cities of Odesa, Kyiv, Lviv, and *Chernivtsi. These include Mendele Mocher Sforim and Sholem-Aleykhem, both of whom spent long periods of time in Odesa. Their works reflect the changing social, political, and economic realities of the traditional East European Jewish community. The Jews made up a significant percentage of the total number of people living on Ukrainian lands before World War II. More than half the Jews living in Ukraine were murdered by the Nazis during the Holocaust. The repression of Jewish life under Soviet rule was especially harsh. Today the Ukrainian Jews enjoy new-found freedoms that are allowing them to rebuild and revitalize their communities. Sean Martin also contributed to the preceding text. He is a historian of East European Jewry from Cleveland, Ohio (USA), and was a Fulbright Scholar in Lviv in 2002. Yaakov Dov Bleich is Chief Rabbi of Kyiv and all Ukraine. The Tale of Bygone Years has an entry of crucial importance for this town: “Yaroslav captured Belz.” This is the first mention of the city located on the banks of the river Solokiya. Historians insist, however, that it existed before 1030 AD, which makes Belz the oldest city in Halychyna. It is thus one of the oldest cities in Europe, an architectural monument of the Middle Ages, which has preserved its characteristic planning and structure of streets and squares. They say that the minute and hour hands on the clock at city hall were once made of Tatar arrows. This is one indication that many battles were fought for the city. It was a tasty morsel, located on the crossroads of several trade routes. Indeed, the city often changed hands: it was part of the Galician-Volhynian Principality (1234-1340), the Grand Duchy of Lithuania (1340-77), under the Hungarian crown (1377-82), then the Polish one (1382-1772). In other words, this city is most closely connected to our complex history and its dramatic pages should be acknowledged. One would think that tourists are frequent guests here. However, the former princely seat, shrouded in legend and mystery, is a dilapidated provincial town from where young people flee and older people leave in search of better jobs. Mayor Ivan Kalysh fought for seven years to attract attention to Belz, watching enviously as Zhovkva’s history was finally honored by marking the 600th anniversary of Magdeburg Law. Belz received these privileges under this law twice, in 1377 and 1509. The current mayor finally succeeded. First, a cabinet resolution was enacted in 2001, granting Belz the status of a historical-cultural preserve. Later, Cabinet Directive No. 235 of July 7, 2005, allocated nearly eight million hryvnias to prepare for the town’s millennium. Now there is hope that in time Belz will become a tourist mecca, attracting pilgrims and tourists from everywhere. (Kalysh is sure of this and his confidence has infected the populace.) This will add to the local population’s worries, albeit pleasant ones, which will mean more jobs and a decent life. The jubilee festivities were a success. Guests came from Poland, Israel, and surrounding Ukrainian towns. There were Cossacks clad in festive attire; there was music and singing to gladden the visitors’ hearts. Even though it was very cold, the town square was packed with merry-makers. People stayed there until the early hours of the morning, greeting each other and remembering good old times; some used the occasion to have a glass or two. The first prince of Belz, Vsevolod Mstyslavych (1180-95) was intrepid and steadfast; in this sense he matched his older brother Roman. The two brothers had a relationship complicated by property disputes. Before his death Vsevolod became a monk. His son and successor Oleksandr Vsevolodovych married the daughter of Kyivan Prince Volodymyr and held the throne of Belz several times. He was a skilled politician and intriguer, who tried to take over Volodymyr’s princedom, even the lands of Halych if the opportunity had presented itself. Historians believe that he ended his life in prison, where he was incarcerated by Danylo Romanovych. After the poisoning of Boleslaw Jerzy II in 1340, Halychyna became the object of a struggle among Hungary, Poland, and Lithuania. Polish king Kazimierz III the Great renewed his agreement with King Louis I of Hungary (Nagy Lajos). Mykhailo Hrushevsky writes that he “talked the pope into giving him money and tried to get at least the lands of Belz and Kholm under his control, in collaboration with the Hungarian king Louis. He launched several campaigns for this purpose, but we have little data on them. The most important event then was the siege of Belz in 1352. After losing interest in further warfare, Louis abandoned Kazimierz and the latter had to return home without achieving anything.” Although the enemy was rebuffed, Belz lost its relic, the miracle-working icon of the Mother of God. No one knows precisely when the icon found its way to Ukraine. According to one theory, Anna, the sister of Byzantine emperors Constantine and Basil, brought it to Kyiv where she arrived as the fiancee of Prince Volodymyr the Great, whereupon the prince ordered the icon installed in the Church of the Tithes, Kyiv’s first brick church. The icon remained there until 1240, when it was secretly transferred to the small princely city of Belz during the onslaught of the Golden Horde. Another theory points to the second half of the 12th century, when the two exiled Byzantine emperors, Andronicus I Comnenus and Alexius of Atel, could have brought the icon as a gift to the princes of Halych, who had offered them refuge. 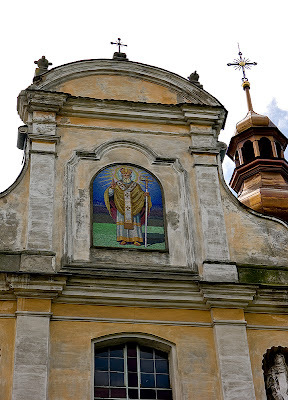 According to a chronicler, one day when he was exploring the valuables at Belz Castle, Duke Wladyslaw Opolski, who had received lands from King Louis, “discovered anew the beauty of the icon created by St. Luke.” Later, when Belz was besieged by the Tatars, Wladyslaw ordered the icon displayed on the castle wall. A Tatar arrow pierced the Virgin’s neck, the hole started oozing blood, and darkness instantly descended on the Tatar troops. Raising their swords against each other, they perished beneath the walls of Belz. Then the duke began considering a plan to transfer the icon to a safer place. Wladyslaw had the icon packed in a box and collecting other valuables, he was about to set off on the long journey, but twice the horses were rooted to the ground. That night the duke had a prophetic dream in which a heavenly voice ordered him to transfer the icon to Jasna Gora and found a monastery there. After the duke promised to do this, the carts were able to set out westward. The duke invited Catholic monks of the Paulist order to the monastery at Jasna Gora and gave them the miracle-working icon. Today, this icon of the Mother of God of Czestochowa is the most popular one in Poland. However, few in Poland know that this icon was in the Galician-Volhynian Principality during the 12th-14th centuries, including the princely city of Belz. True, Belz now has this icon. 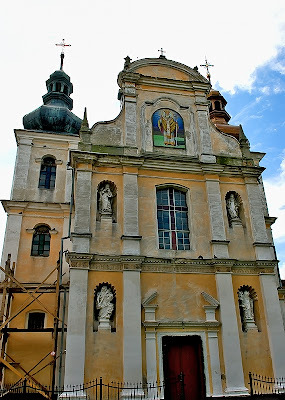 On Dec. 11, the long- awaited ceremony marking the presentation of a copy of the Mother of God of Czestochowa (of Belz) took place in a Roman Catholic church in the village of Dolhobyszow in the province of Hrubieszow (Hrubeshiv). From now on this icon will remain forever at St. Michael’s Church (Ukrainian Orthodox Church, Kyiv Patriarchate) and will help the residents of Belz overcome all their problems, and it will be with them on weekdays and holidays. It is simply unbelievable that little is manufactured in this town, which has so few financial resources. In the Middle Ages Belz was host to large fairs twice a year. At the time this city was famous for the wares of its shoemakers, weavers, coopers, and blacksmiths. It was thought that the best sword-makers resided in Lviv and Belz. Starting in the 1460s, local Ukrainian and Polish Catholic craftsmen founded two guilds in the city. In general, a student of history can only marvel at the huge benefits that rulers conferred on cities if they wanted them to develop; at the scope of local self-government, and the broad powers vested in the elected municipal council headed by the burgomaster and the reeve. For example, the warehousing of salt was the most important privilege for Belz. This gave the city a monopoly on the salt trade in the northwestern part of Rus’ and beyond its borders, and generated significant profits. The Belz municipal council also had the right to collect bridge tolls for passage across the Solokiya River and the duties imposed on mead and other kinds of hard liquor. Toward the end of the 15th century the city was granted the right to cut down trees in the forests on the territory of the starosta district. A privilege, or charter, dated Nov. 10, 1509, once again granted Belz privileges under the Magdeburg Law, whereby the residents were temporarily relieved of tax payments and were allowed to hold fairs and trading. In 1512 King Sigismund I reaffirmed the tax-exempt status of the city and its outskirts; a year later he allowed the town to have a candle-making factory. In 1532 Belz obtained the right to collect duties from merchants passing through the town, and in 1546 King Sigismund Augustus granted Belz the right to collect the royal duty on grain sales (known as pomirne). Civic life thrived at this time. There were schools, monasteries, and guilds. Jakob of Belz, a noted scholar and academician of Krakow University, was born there in 1453. However, it cannot be said that Lady Fate always smiled upon Belz. Although it was devastated by wars and fires, every time it rose from the ruins, perhaps because of its democracy and tolerance. In 1665, when the city was in decline, the local Jewish community obtained equal rights with the Roman Catholics, and they were allowed to build homes in the city. From this time the proportion of Jews increased. Until World War II the town was inhabited by Ukrainians, Jews, and Poles. During the First World War the city sustained considerable damage. In January-February 1919 it was the site of pitched battles between the Ukrainian Galician Army (UHA) and Polish troops. 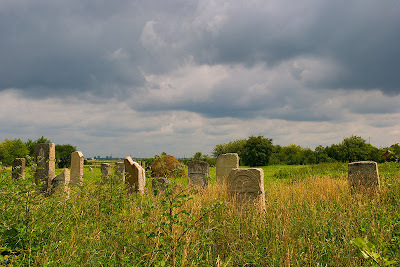 The Belz cemetery has eight common graves that contain the remains of over 100 soldiers of the Ukrainian army. Before WWII, the population of Belz numbered 7,000, 40 percent of whom were Jews. There were several small businesses: a brickyard, oil factory, power plant, sawmill, and factory that produced brushes. Needless to say, the people who lived there knew how to trade; here one could always find goods to satisfy every taste. In those days the town was made famous by the popular song “Mein Shteitele Belz,” which is still one of the world’s best known Jewish melodies. Initially, as a result of the Molotov-Ribbentrop Pact, the town found itself on the German side, because the frontier between the Soviet Union and the General Government of the Third Reich passed along the river Solokiya. After the war Belz ended up on Polish territory. Almost the entire Ukrainian population of the town and the surrounding villages was deported to the Ukrainian SSR, while those who tried to dodge repatriation were deported by the Poles in 1947, during Operation Vistula. In 1951, on the basis of the Soviet-Polish treaty, the towns of Belz, Uhniw, Variazh, and Krystynopil were exchanged for the district of Ustryk Dolishnikh. The towns were handed over empty, as the Poles had already been resettled. They were settled by residents from villages in Halychyna and resettlers from other raions of the USSR. Today there are very few indigenous residents left in the town. There are only two Jews living there today. Yet the Jewish Diaspora paid for the construction of a small hotel that accommodates quite a few tourists eager to visit this former religious center of Judaism. After all, it was here that the miracle-working Hassidic Tzadik Sholem Rokakh made his home. From then on the title of tzadik has been handed down from father to son in the Rokakh family, and Hassidim flocked to the city. What can they see there today? Whereas artillery shells turned the Great Synagogue, Bet Midrash, and the Talmud Torah into ruins, under the Soviets they were completely demolished. On the site of the Great Synagogue are a vacant lot and the playground of a local high school. 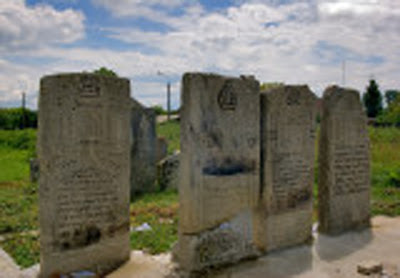 The only surviving monument to Jewish culture in Belz is a former mikvah (ritual bath), a building belonging to the Ishre Lev prayer society that was rebuilt after the First World War, and an entrenchment on the outskirts of Lublin, where one can find fragments of several matzoh. However, the Jewish community believes that even this is worth restoring Belz in the nearest future, and the synagogue, the ritual baths, and baptismal fonts are being rebuilt. What is being planned for the town with budget funds? Most of all the residents of Belz are expecting to be hooked up to gas, for which four million hryvnias have been allotted. The sewer system is continuing to be modernized. Funds have been channeled into restoring historical sites and the town’s infrastructure. Nearly 850,000 hryvnias have been spent on restoring buildings and architectural sites in the center of town. “It’s true that delayed funding is a problem,” says Mayor Kalysh, “and it has slowed down a number of scheduled projects. The cabinet directive came in July, and relevant government instructions continued arriving throughout September. But we’re happy even with that, because we succeeded in doing the main work. Today the town is lit at night. We have also restored Saint Mary’s Chapel with funds from Naftohaz Ukrainy, 1.5 million hryvnias. The icon of the Mother of God now hangs there after being transferred from Poland. We have restored city hall and finished repairing the facades of the downtown buildings. What is your current population? I.K: There are some 3,000 people living in Belz. Don’t be surprised; I know a Polish town, Kazimierz Gorny near Warsaw, with a population of 2,000, but every year it welcomes nearly a million tourists. We also have the Ukrainian president’s instruction concerning the start of construction of a customs crossing at Belz; this will also give an impetus to the development of this former princely seat. Above all, however, we are counting on pilgrims and tourists. Every year this town receives at least 10,000 Jews, who come to pay homage to the graves of Tzadiks. There is also an increasing influx of Polish tourists. This town has about 60 architectural sites, five of which are of national importance. These include the Dominican complex with St. Michael’s Church; the Dominican convent, a wooden church with a chapel, the church at Zamochok, and the Aryan Gate. It should be emphasized that among the mayor’s active supporters are the archaeologists that work every summer in Belz, excavating wonderful precious objects. They have discovered enough to fill an entire history museum. Every cultural layer, every centimeter yields fresh material for study. Two years ago a team of archaeology students from Drohobych University discovered a cache of ancient coins, including eight dating to 1380, the times of Queen Jadwiga. No one has found such coins anywhere else. In Zamochok they unearthed ancient wood structures with a snow-white flooring — a thrilling find! They have also discovered many pieces of unusual ceramics. The residents of Belz are always pestering the archaeologists about whether they have found the golden horses. Legend has it that in the mid-18th century some local Jews buried a gold carriage and gold horses somewhere in the vicinity, and that the treasure is still waiting to be found. Archaeologists joke that so far they have found only iron horseshoes. But they are determined to keep searching, confident that they will make many new discoveries. We have been informed by Victor KUZIO, Lviv, Ukraine Victor's e-mail address that Kalysh Ivan Pavlovych is currently the Mayor of Belz. The e-mail address to the city authorities is e-mail address. This information was confirmed on the Belz web page from the Association of Towns of Ukraine that can be found in English at the following URL click here for URL. Above is the Mayor's name in Ukraine. The above photograph was taken by Samuel Gruber in 2000. One of the few surviving gravestones of the cleared and fenced cemetery. The above photograph was taken by Mostogrorskie. The above photograph was taken by Samuel Gruber in 2000. It shows the detail of the fence and gate that are enclosing the cemetery. BELZ: US Commission No. UA13170101 Alternate name: Beltz (German) and Belz (Polish). The town is located at 50º23 24º10, 62km from Lvov, 25km from Sokal' and 20km from Chervonograd. 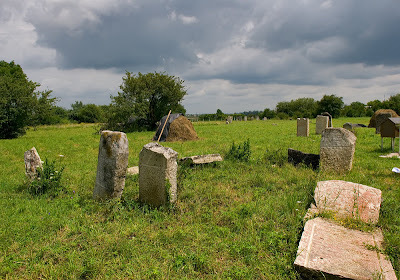 Cemetery: the W outskirts, near the entrance to town from Rava-Russkaya. Present town population is 1,000-5,000 with no Jews (although there is a report that there might be 2 Jewish people living in the town). The oldest stone is from 1708. There are about 100 to 500 gravestones at this cemetery. 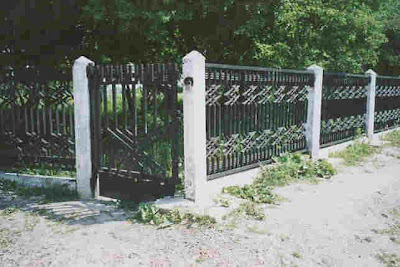 The cemetery has a fence with a gate, but without a lock. There is no sign or marker for this cemetery. Town: Mayor of town-Sapuga Vadim Mikhaylovich of Town Soviet [ph: (257) 46210]. Regional: Regional Soviet of Chairman-Naumchuk S.S. [ph: (257) 46210]. Soviet of Lvovskaya Oblast - Chairman-Goryn. Jewish Community of Lvovskaya Oblast. The hasidic synagogue in Belz. Rabbi Shalom Rokeach personally helped build the city's large and imposing synagogue which was dedicated in 1843. The building resembled an ancient fortress, with three-foot thick walls, a castellated roof and battlements adorned with gilded copper balls. It could seat 5,000 worshippers and had superb acoustics. It stood until the Nazis invaded Belz in late 1939. Though the Germans attempted to destroy the synagogue first by fire and then by dynamite, they were unsuccessful. Finally they conscripted Jewish men to take the building apart, brick by brick. It was finally completely demolished in 1950. 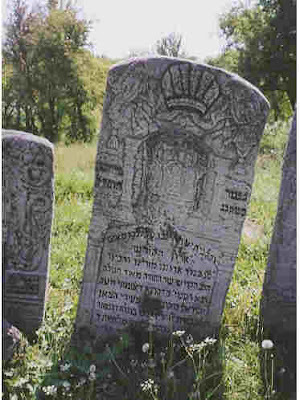 Hasidic Judaism has its roots in what is now the Lviv region of Ukraine. It began as a movement of Jews seeking a more pious, charismatic and even mystical approach to their faith that extended beyond Jewish law. Belzer Hasidism originated in 1817 when Rabbi Shalom Rokeach was inducted as rabbi of Belz. He was a profound Torah scholar and legendary miracle worker. Rabbi Shalom led the construction of the town's immense synagogue and school complex. When it was finally dedicated in 1843, the synagogue looked like a fortress, surrounded by walls that were three-foot-thick. A castellated roof and battlements adorned the synagogue, which was able to seat 5,000 worshippers. 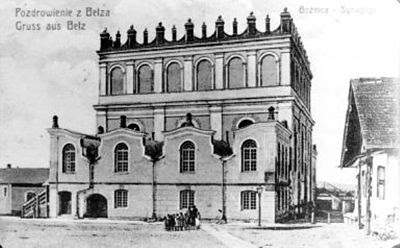 The Belz synagogue produced many great torah scholars, and the community thrived until the World War II invasion of German soldiers, who slaughtered families and razed the city. Though the Germans attempted to destroy the synagogue, first by fire and then by dynamite, they were unsuccessful. Finally they conscripted Jewish men to take the building apart, brick by brick, according to Wikipedia. Belzer Hasids survived either by accepting Soviet citizenship and subsequent deportation to Siberia, or by fleeing through Europe with the help of Samaritans and financing from Belzer Hasids abroad. Only the foundation of the immense Bet Midrash compound remains, although other smaller structures such as the community's Ishre Lev prayer center survived. 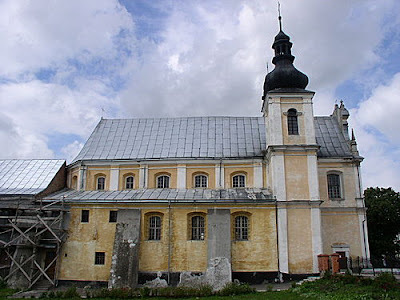 The Dominican convent for nuns in Belz was built in 1743. This part of it is the church of St. Nicolas, which had been used as a storehouse after the WW II. In 1991 this was restored and today is again used to serve the Greek Catholic worshippers. The 4th picture shows the Fresco on the front of the church. The 1st picture was taken by Mostogorskiy. He has given us permission to add this pictures to this blog. Does anyone have any photographs of Belz? Rabbi Shalom Rokeach was born in 1779 and died on 10 September 1855. He founded the Belz Hasidic Dynasty. He was also known as the Sar Shalom. He was inducted as rabbi of Belz in 1817. He was a great Torah scholar and legendary miracle worker. Rabbi Shalom personally helped build the city's large and imposing synagogue which was dedicated in 1843 and stood until the Nazis invaded Belz in late 1939. He is buried in Belz. Rabbi Joshua (Yehoshua) Rokeach was born in 1825 and died in 1894. He was the son of Rabbi Shalom Rokeach and succeeded his father. He was deeply involved in Jewish public life. Belzer chasidus grew in size during Rebbe Joshua's tenure. As early as 1878, several Galician admorim, headed by Joshua Rokeach of Belz, established an organization named Mahazikei ha-Dat (defenders of faith), which was supposed to oppose the maskilim of Lwów and promote the interests of Hasidic Orthodoxy using modern, political tools: They published a newspaper, participated in Austrian parliamentary elections, and operated in the standard frames of political action. Rabbi Issacher (Yissachar) Dov Rokeach was born in 1854 and died in 1926. He was the son of Rabbi Joshua Rokeach and succeeded his father. World War I and the disintegration of the multinational empires Austro-Hungary and Czarist Russia resulted in the physical destruction of some of the greatest Hasidic centers in the Ukraine, Poland, and Galicia (such as the courts of Sadegora, Czortków, and Belz). The Zaddikim, their families, and associates were forced to relocate, departing for other countries or large cities (such as Vienna). This shift of Hasidic courts from the small Shtetl or township to the great city was one of the signs of the times. Rabbi Aharon Rokeach was born as the first son of Rabbi Issacher Dov Rokeach in 1877. He succeeded his father upon the father's death in 1926. A deeply spiritual, almost mystical man, who studied much and slept and ate little, Rebbe Aharon was known for his saintliness and his miracle-working capabilities. Many of his followers reported experiencing miraculous recoveries or successes after receiving his blessing, and flocked to his court by the thousands. Aharon was called the "Wonder Rebbe" by Jews and gentiles alike for the miracles they claimed he performed. The "Wonder Rebbe" was at the top of the Gestapo's "wanted list" of rabbis targeted for extradition and extermination during the Nazi occupation of Poland. Thanks to the untiring efforts and cash inflow from Belzer Hasidim in Israel England and the United States, the Rebbe and his half-brother, Rabbi Mordechai of Bilgorai, 22 years his junior, managed to stay one step ahead of the Nazis in one miraculous escape attempt after another. Notwithstanding the watchful presence of Gestapo patrols at every turn, the pair was spirited out of Belz and into Sokal, then Premishlan, then to the Cracow ghetto, and then to the Bochnia ghetto. In their most hair-raising escape attempt, the brothers were driven out of occupied Poland and into Hungary by a Hungarian counter-intelligence agent who was friendly to Jews. The Rebbe, his brother, and his attendant, shorn of their distinctive beards and side locks, were disguised as Russian generals who had been captured at the front and were being taken to Budapest for questioning. To quell rumors of the Rebbe's disappearance from the ghetto, one of his Hasidim dressed up in Rebbe Aharon's clothing and sat in his inner sanctum all day, imitating the way the Rebbe immersed himself in prayer and study. When other hasidim urged the Rebbe's attendant to let them send in their kvittlach ("notes" or "petitions for blessings"), they heard a perfect imitation of the Rebbe's voice, mumbling his blessings. The refugees subsequently reported that they had experienced "miracles" at each stage of the escape. Throughout the 250-mile drive across occupied Poland, according to the Hungarian agent, the escape vehicle was enveloped in an "eerie mist" that made it difficult for the car to be detected. When the agent asked the driver to stop along the way and join him for something to eat, leaving the refugees unguarded, the two were unable to locate the car upon their return. They finally identified it by feeling for it in the place they had parked it. As the refugees passed into Hungary, they were stopped by several patrols. At one checkpoint, their identity was questioned and they were about to be detained when three high-ranking Hungarian officials appeared and ordered that the car be let through. Belzer Hasidim believe that those three men were the "first three Belzer Rebbes sent from Heaven" to expedite Rebbe Aharon's escape. Aharon and Mordechai immigrated to the British Mandate of Palestine in 1944. The two lost their entire extended families, including their wives, children, and grandchildren. Both remarried shortly after arriving in the Holy Land, although only Mordechai produced an heir, Yissachar Dov Rokeach. After Mordechai's sudden death in 1948, his son was groomed by Aharon to be the next Belzer Rebbe. Under Aharon's leadership, the Belzer Hasidut was reborn after the war in Israel and, to a lesser extent, in the United States. Rabbi R. Shalom Rokeach was another son of Rabbi Issacher Dov Sokeah and in 1930 was elected Rabbi of Opatów, Poland in the Swietokrzyskie Voivodeship. He was the last rabbi of Opatów and perished in the Holocaust. Rabbi Issachar (Yissachar) Dov Rokeach is the firth and present Belzer Rebbe and was living in Jerusalem, Israel in 1995. There is a Belz Memorial Book that was published in 1974 in Tel Aviv, Israel by the Belz Societies in Israel and America. It is 559 pages and in Hebew and Yiddish. There is no English translation of this entire Memorial Book. Only about four (4) of the chapters have been translated into English. It would be nice to have a complete English translation of this Memorial Book. If there are any additional people who would like to see an English translation of this Memorial Book, please post your comments here. In 1900 the Jewish population was 2,872. At the beginning of World War I Belz had 6,100 inhabitants, of which 3,600 were Jewish, 1,600 were Ukrainians and 900 were Poles. In 2004 the estimated population was 2,408 with most likely no Jewish people. 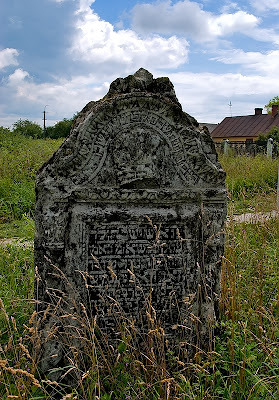 Belz (Ukrainian, Белз - Polish, Bełz - German, Bels - Yiddish - בעלז) also can be written as Belsk, Beltz and Belzec, is a small town in the Lviv Oblast (province) of western Ukraine, near the border with Poland. It is located between the Solokiya River (affluent of the Bug River) and the Rzeczyca Stream. The latitude and longitude coordinates of Belz are 50°23' 24°01'. The town has existed since at least the 10th century with the Jewish community being established in around the 14th century. In 1665 Jews in Belz got equal rights and duties. The town became home to hasidim in the early 19th century. Belz is shown as a red star at the bottom center of map.